CB: Did you come up with the concept of the characters first, before you went with the story? Or was it a story that you wanted to tell? Zubkavich: The visuals actually of the two characters came out of the original artist who did the two short stories for PopGun, Chris Stevens. He designed these two characters as contrasting opposites, you know, the big and the tall, the wide and the more of that “bulky” top, so those visuals then sort of built the personalities. So then it organically grew from that - and the original story was much more closed. It was just these two nameless idiots going through town, and they cause trouble, and they kill monsters, and they leave. And the people in the town are like “Who were those guys? They were worse for us than the monsters.” That was sort of the original gag, and then it was building a bigger and bigger base for them to bulldoze through, essentially. Now the big story that we're telling is that - the classic fantasy story is like the Heroes of Destiny - and so we're deconstructing that, and destroying that and making fun of it. So that is now overlayed on these characters and on this bigger world. CB: How far out have you planned? Zubkavich: I know exactly where we're going. My master plan is for us to do ideally six story arcs, so that way we'll have six thin trade paperbacks, and then three of them doubled up for the hardbacks. It'll be a fantasy trilogy, right? And then we have these guys steam roll through every major fantasy trope. We had them in town with all the political intrigue and nobles, and the third story arc they're with the pirates on the high seas, and I've got ideas for vikings, and the Northern reaches, like they're trapped in the desert, or in the jungle. All of those traveling fantasy tropes. Eventually they've just got to crush along. CB: While it is certainly easy to engage with Skullkickers in terms of the humor and the action of the book, is there a larger theme you hope your audience will take from it? Zubkavich: Well, the Heroes of Destiny trope is like the ultimate theme where the audience will say something like, “Hey, this is every fantasy story,” only you know it's a fantasy story so we're going to play with it. Every time you think we're going to go straight, we're going to go a little off kilter, and stuff like that. There's a British show called Red Dwarf, which is this Sci Fi comedy, and if you watch each individual episode, it's very funny. But if you watch seasons of it, you go “You know for a very dumb show with a dumb core premise - this is surprisingly complex.” This has bigger themes, and I can see jokes are coming back around in echoes. You plan this very meticulously for something so stupid, right? I think if we finish up the series people will look back and go “That's the most intellectually complex stupid thing I've ever seen. That is incredibly low brow-high fantasy, that's so well constructed for it's stupidity.” I think that would be the best compliment I could get. 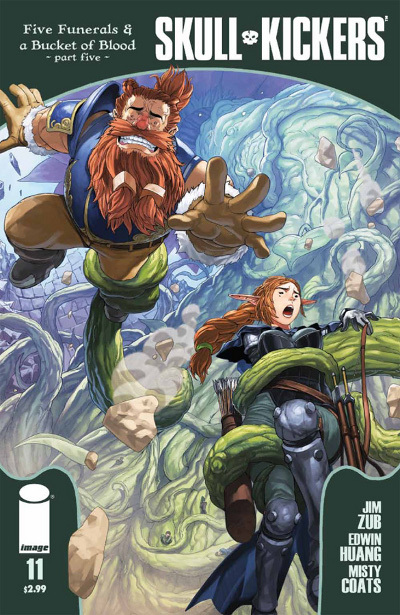 CB: Are you planning on taking Skullkickers elsewhere other than just books? Zubkavich: Yeah, we actually got representation now so it's being shopped around in terms of Hollywood, and video games, stuff like that. 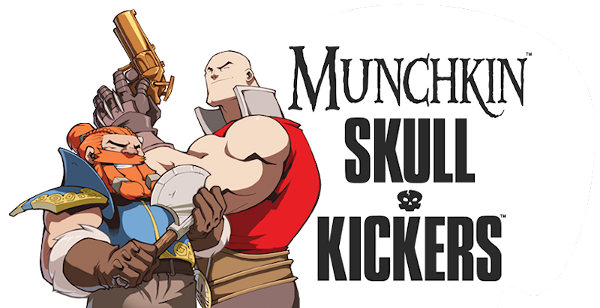 There is a really popular fantasy card game called Munchkin by Steve Jackson Games, and we're actually doing an expansion of Skullkickers. It comes out this summer. I think it's going to be great for finding new readers who are in the same mindset as what we do. CB: What's been the most effective marketing you've been doing for the book? Zubkavich: What we recently started doing is... well, see, the tough thing with independent comics is really finding new readers. I mean, when we were kids growing up reading comics, we would just buy a random issue of Spider-Man, and if we got hooked we would just keep buying it. But now these people want to go from the start. They want the first issue. For Skullkickers, issue #13 is coming out in April, and it's hard to get people to start with #13. They're not going to want to do that. So, one of the things we've started doing is serializing our older issues online for free. It's like I lent it to you, or your buddy lent it to you, and people can get in from the start. We've had really good success with that. We've been getting really good web traffic, and people who have never heard of the book now have heard of it, are reading it, and becoming fans of it. So the internet touches everyone so it is a nice even base for us to really get the word out. We get a lot of fantasy based fans in general, so I kind of target those types of elements quite a bit, and those types of websites. CB: You're also doing a bunch of other stuff, too, other than Skullkickers? Zubkavich: I've got a new graphic novel that I'm doing through Udon, which is a very different book. It's called the Makeshift Miracle, and it's kind of a mystery drama that I'm doing. Beautiful watercolor artwork done by this guy named Shun Hong Chan. I've got other writing that I'm doing for Bandai, the Media company in Japan. I've written comics for Street Fighter. I've done all sorts of different stuff. Skullkickers is near and dear to my heart, but I've also got a bunch of other stuff I'm - so to say - exploring, and hoping I can sort of play in all the different worlds. CB: So Skullkickers is opening a lot of different doors for you? Zubkavich: Yeah, It's been great. Image is a top tier publisher, and so it gives you a level of exposure, and people take notice of it a lot more. I could tell people “Hey it's the same publisher as The Walking Dead” and someone takes you seriously all of a sudden. I think we're all riding Robert's coat-tails right now. That's sort of the reality of it right now. It's been really useful to show people “this is my work- this is the way that I do things”, and it's fun. But it's well done, and it's professional and we're on time. The book is silly, but I take it very seriously for lack of a better term. That's what being professional is all about. It really has opened doors, and it's given me some great opportunities. CB: How did you additionally hook up with Image? 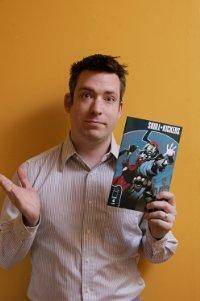 Zubkavich: A friend of mine, Joe Keatinge. who now does Glory, he was the editor on PopGun the Anthology. He ended up contacting Chris Stevens, the original artist and I, to do a short story. So we did the original ten page short story of these two idiots. And Eric Larsen was head publisher at Image at the time, he took notice of that and he said “This is good, I like it. You should do more.” So we did another short story in PopGun vol.3, and then Eric Larsen said “If you pitch this as a series, I'd be on board for that.” I had other freelance work I was doing, and Chris was super busy. We just sort of fell by the wayside. I guess that will never happen. Then Edwin Huang came along and I was sort of pulling it out of the moth balls, and we went, “Okay we're going to do this for real now.” It's been awesome ever since. CB: I have to compliment you on your inventive use of sound effects in the book, It's one of the things that my son comments the most on after reading an issue. But the whole package really appeals to him and his friends.